a friend of mine in new york, whom i am sure i have mentioned before, is a professional drummer, and a particularly good one at that, but like many professional rock or jazz musicians he has his eccentricities, most of which, as far as i am aware, are quite endearing. what brought him to my attention almost ten years ago was not only his gracious but extrovert drumming style, but the way he set up his drumkit. those of you not in the least interested in the world of drumming, or, perchance, any other musical instrument in the rock and jazz field, will likely have made the fundamental mistake of considering every drumset to look pretty much the same. however, simply think back to those unforgettable moments when your spouse has declared that to her/him, all bikes look just the same. the idiosyncracy, in this case, was the employment of a thin, large bass drum sitting only a few centimetres in front of his regular bass drum; a woofer in percussive parlance. the idea here is to enhance the initial bass drum beat, by altering and amplifying its thudding beat, something that has to be heard to be believed. maybe. i believe the original idea was that the drummer would use a woofer of the same diameter as the bass drum that arrived with the set, and have it held in place by one or two restraining brackets. however, not everyone is compelled to follow the picture in the catalogue. however, it may surprise you to know that, even in the world of percussive endeavour, technology takes its toll; or pushes the boundaries ever forward, depending on your point of view and bank balance. as an endorsed (read: sponsored) drummer, nice wooden stuff seemingly arrives at his new york studio with unfailing regularity, and the appearance of the latest development in bass drum thinking has seen him divest himself of the woofer and settle for something that looks far more conservative and approachable: a twenty three inch diameter bass drum. yet again, i perceive a whooshing of air over many unhelmeted heads, but allow me to educate you in the way of the bass drum, that you may appreciate this ground-breaking state of affairs. for historical reasons, the origin of which i know not, bass drum diameters have always been even numbers. the smallest practical bass drum size currently on the market is eighteen inches round, a size beloved of many a jazz drummer, and, seeing as you ask, of yours truly. this steps up to twenty, twenty-two (probably the most common size), twenty-four and twenty-six, the latter once the province of the big-band drummer. get to twenty-eight, and you're into pipe band and marching band territory. 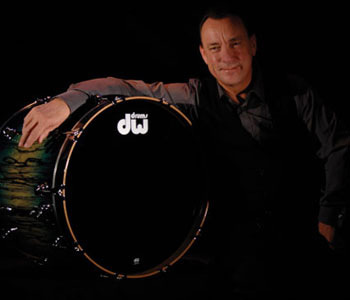 but for perfectly sound marketing rhetoric, drum workshop decided to produce a twenty-three inch bass drum, glowingly fawned over by neil peart of rush in a dw youtube video. from a purely subjective listening point of view, i cannot see what the fuss is all about, but then i don't care for external headsets and bb30 bottom brackets, so perhaps i'm not the ideal consultant on such matters. but when all is considered, there is little to prevent any drum company unleashing odd-sized drums on an unsuspecting public, apart from one not inconsiderable problem. if i might refer back to my lengthy diatribe on the even numbered sizes currently on offer, it seems pertinent to point out that these sizes all need to have a plastic drum head of one variety or other fitted on each end. it's also worth pointing out that with one exception, the makers of drums are not the makers of the heads that fit them. thus, if you'd care to peruse the catalogues of remo and evans, both of whom proffer quality drumheads, you will find no such animal as a twenty-three inch bass drum head. this could be something of a problem; it's not that bass drum heads are prone to breaking, certainly not the front one, but they do require to be replaced from time to time. it's going to be a bit of a pain, to put not too fine a point on it, to walk into your local music shop, ask after a 23" head, only to be met with either a quizzical look or a smug grin. sometimes there are reasons for standards. so while you are querying the relevance of bass drum diameters to any part of a bicycle, allow me to direct your line of sight towards the water bottle enclosed in that carbon/alloy/steel cage bolted to its down tube. should i happen to lie awake this evening having one of those eureka moments, during which the notion of a washingmachinepost water bottle becomes one of life's imperatives, i need only worry about capacity, colour and wording. bicycle water bottles the world over are all the same core size, so that the other chaps lying awake figuring out ever more extravagant bottle cage designs will meet the manufacturers in the middle, and all will be well with the world. but the bicycle water bottle was designed thousands of years ago (well, perhaps a slight exaggeration), before man imbibed fascinating powders and potions to increase isotonic absorption and carbohydrate intake. 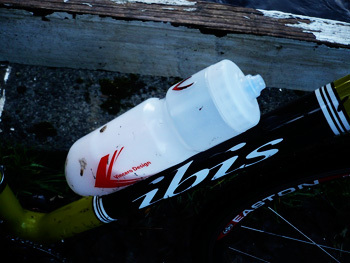 thus it is conceivable that the water bottle we all know and love might fancy a change of shape, particularly in light of the current obsession with hours spent in the wind-tunnel. such morphing would, however, result in the need for an accommodating cage of proprietary construction, suitable only for grasping the bottle it was matched with. surely there must be another way? while there's nothing really new under the sun, the edge 16 looks to me like something new under the sun. 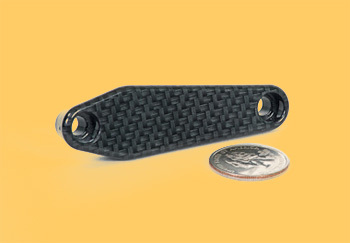 weighing a scant 16grams (that's a lot less than an ounce), the edge is fabricated from carbon composites in a sort of kite shape, featuring a hole at each end allowing it to be bolted to the down-tube or seat-tube. so far so good. encased in the edge16 is a particularly effective magnet which pairs with a corresponding magnet fitted to the bottle with which it is designed to work. 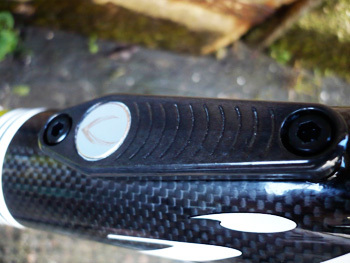 the bottle has a wide groove that matches precisely the shape of the edge 16 bolted to the bike. it probably shouldn't work; but does it? while the bottles offered by vincero design, creators of the edge still conform pretty much to the size and shape you'd tend to expect, there is no real good reason as to why they should stay that way. if you remember campagnolo's aero water bottle and its accompanying cage, here's the ideal, contemporary solution to the wind tunnel smoke. with the ibis hakkalugi still in residence, cyclo-cross would seem to be that other obvious problem looking for a solution. if we take scot nicol at his word, the hakkalugi is not only a performance machine for the sport of 'cross, but the ideal bicycle for traversing a modicum of rough stuff. in this latter case, a bottle and cage would not seem out of place, particularly if your exertions are directed at training for the next mudfest. not only would it be something of a pain to have to remove the cage everytime you pinned on a number, but sod's law would dictate that at least one of those threads is going to strip in the process along the way. having turned up with hakkalugi, edge and bottle in situ, i was met with two confident 'that'll fall off's before a pedal had been turned in anger, or even in mild irritation. for an hour and a half playing with abandon through the woods, up hill and down dale, through splashy puddles and potholed tracks, the bottle remained pinned to its slot. grabbing it for drinking is a simple case of rolling the bottle to one side or t'other, and there's a thoughtfully raised logo at the top to let you know when it's lined up correctly to slide onto the edge16 bolted to the bike. i had deliberately filled the bottle to the brim (and i had one of the larger bottles on offer), yet it remained as solid as a bottle on a magnet. lest i had given it too soft a ride, and not really stretched it to its magnetic limits, on the way home from debbie's, i took a left onto a long forgotten road leading to nowhere in particular, now strewn with loose gravel, water-filled potholes and liberal quantities of grass growing along the centre. making sure i'd not fitted the bottle properly (because you just know that's going to happen at some point), and it was just clinging on by the skin of its magnetic teeth, i pedalled my very worst. potholes, gravel and lumpy grass were all fair game, and i hit everything as hard, fast and as awkwardly as i could (which, just to digress, said a great deal for the ibis). at the end of the road, the bottle was still affixed to the bicycle, and i felt guilty for having ever doubted its effectiveness. with the current trend for hiding all the cables inside the bicycle tubes, fitting an edge16 seems the ultimate practical accessory to retain clean lines. 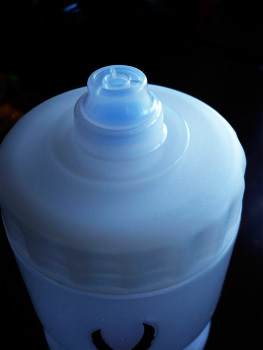 it's efficacious in more ways than one, particularly as the cap has a rather ingenious baffle at the lid, preventing any liquid from escaping when really it shouldn't be. the only shortcoming i can see at present is the reliance on bottles from vincero; should that get left behind or lost, there's no way to substitute another lying in the cupboard. however, in much the same way as the 23" bass drum, the more folks using it, the more likely that compatible bottles or drumheads will become readily available. at present, the device is not available through retail in the uk, though i daresay it could be ordered from vincero design in boulder, colorado. the edge16 including bottle sells for $46.95, considerably less than the cost of some carbon fibre cages these days. if you're ordering, it might make a deal of sense to ask for more than one bottle. just remember who let you in on the secret first.